“Exceptional professionalism and tremendous stamina,” said Minister of National Security, Senator Jeffrey Baron today [July 21] in reflecting on the response of the Bermuda Fire & Rescue Service [BFRS] to this morning’s fire on Front Street. 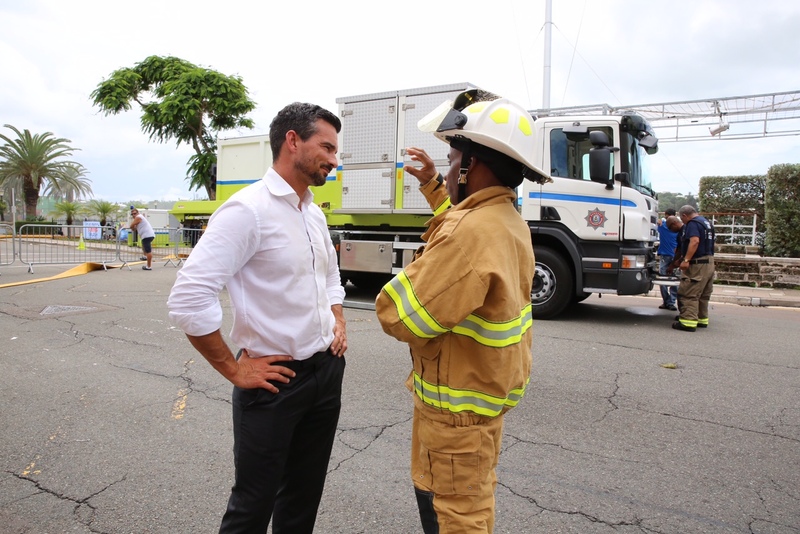 Earlier today, Minister Baron had the opportunity to visit the scene and survey the damage, while the BFRS continued to deal with remaining hotspots ensuring the fire remained under control. “Thankfully no injuries or loss of life were sustained in this fire. Those businesses who had disaster recovery plans and enacted them have shown the value of being prepared for events such as this. “The scene will continue to be managed to ensure maximum safety in the aftermath so we ask for the motoring public’s continued patience as we move to secure the site and re-open roads. You can view our ongoing updates of the fire here and all our coverage here. Min. Baron looking ‘fabulous’ in the first pic. What else would we all expect. Firefighters are exceptionally trained individuals who are educated, quick to think through problems and highly-skilled in their areas of expertise. Has s#!t to do with the Minister. Not a word from the Mayor as I can see. Guess the Minister of Non-Works is next. Yet these are the public servants oba and their supporters love to hate!! Ya, reminds me of de saying, Black people are stereotyped as lazy until they stopped working for free. People are ONLY appritiated when its convenient !!!!!!!!!!!!!!!!!!!!!!!!!! That is such a nasty and devisive statement that you need to back it up. So this guy carried a Camera Crew out to film him in a high lift and trying to touch and greet all the firefighters. Then they say we have no money. Waste of time. let them do their jobs, you ain’t adding anything to the activity Baron! The photo above would be a great Caption Contest photo. Just another photo op. SMH!